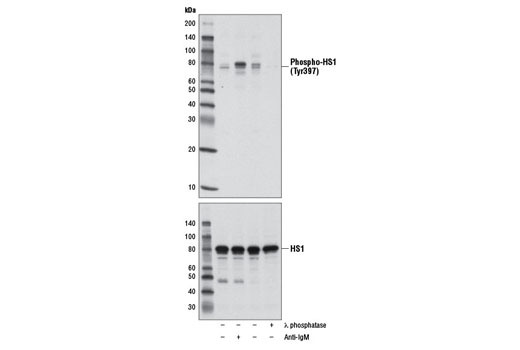 Western blot analysis of extracts from Ramos cells, serum starved for 12 hours, then treated with anti-IgM antibody or λ phosphatase, using Phospho-HS1 (Tyr397) (D12C1) XP® Rabbit mAb (upper), or HS1 Antibody (Human Specific) #4503 (lower). 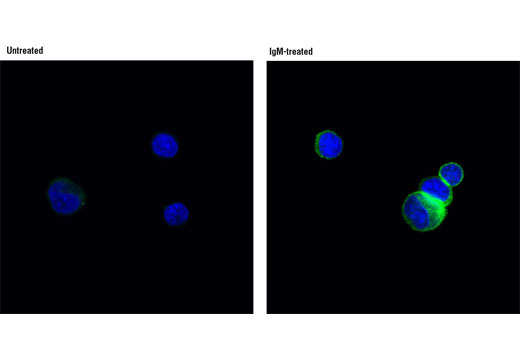 Confocal immunofluorescent analysis of Ramos cells, untreated (left) or treated with IgM (12 μg/mL, 10 min, right) using Phospho-HS1 (Tyr397) (D12C1) XP® Rabbit mAb (green). Blue pseudocolor= DRAQ5® #4084 (fluorescent DNA dye). Flow cytometric analysis of Ramos cells, untreated (blue) or IgM-treated (green), using Phospho-HS1 (Tyr397) (D12C1) XP® Rabbit mAb. 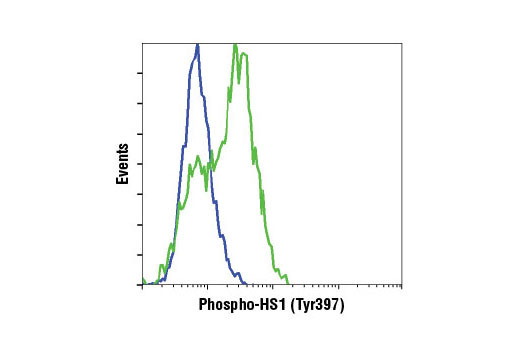 Phospho-HS1 (Tyr397) (D12C1) XP® Rabbit mAb recognizes endogenous levels of HS1 protein only when phosphorylated at Tyr397. Monoclonal antibody is produced by immunizing animals with a synthetic phosphopeptide corresponding to residues surrounding Tyr405 of mouse HS1 protein. This site corresponds to Tyr397 of human HS1 protein. HS1 (HCLS1, LckBP1, p75) is a protein kinase substrate that is expressed only in tissues and cells of hematopoietic origin (1,2). HS1 contains four cortactin repeats and a single SH3 domain (2). This intracellular protein is phosphorylated following immune receptor activation, which promotes recruitment of HS1 to the immune synapse (3-5). Phosphorylation of HS1 is required to regulate actin dynamics and provide docking sites for many other signaling molecules, such as Vav1 and PLCγ1 (6). HS1 also plays an important role in platelet activation (7). HS1 is rapidly phosphorylated at Tyr397 by Syk and/or Lyn kinases following immune receptor stimulation and thrombin-mediated platelet stimulation. This phosphorylation is an important step in cytoskeletal rearrangement and signaling complex formation (6-10). Kitamura, D. et al. (1989) Nucleic Acids Res 17, 9367-79. Kitamura, D. et al. (1995) Biochem Biophys Res Commun 208, 1137-46. Suzuki, H. et al. (1997) J Immunol 159, 5881-8. Hata, D. et al. (1994) Immunol Lett 40, 65-71. Yamanashi, Y. et al. (1993) Proc Natl Acad Sci USA 90, 3631-5. Gomez, T.S. et al. (2006) Immunity 24, 741-52. Kahner, B.N. et al. (2007) Blood 110, 2449-56. Yamanashi, Y. et al. (1997) J Exp Med 185, 1387-92. Hao, J.J. et al. (2004) J Biol Chem 279, 33413-20. Brunati, A.M. et al. (2005) J Biol Chem 280, 21029-35.